90 Day Fiance: Ashley Martson and Jay Smith Married in Jamaica – Leaked Pics! 90 Day Fiance couple Ashley Martson and Jay Smith married before this season aired and it was in Jamaica, not Mechanicsburg. Someone leaked the pics and there’s one good guess who that was. With Ashley engaged in a nasty social media war with her former bestie Natalie Crawford, she seems the likely choice. Then again, maybe it was Ashley herself that spilled the pics to get some attention for her and Jay. Either way – we’ve got the pics! Ashley Martson Married Jay Smith in Jamaica? A brand new Instagram account was set up, it seems, specifically to leak these photos. The name on the Insta is “callingyououtfraud2” and it has only the photos of Ashley Martson’s wedding on it. There is a series of four photos and it seems clear that the event took place in Jamaica, as Mechanicsburg, PA has no coastline like that nor is it tropical. But was this a wedding, a wedding photo shoot, a leak, or a desperate bid for attention? 90 Day Fiance super-fan and vlogger John Yates shined a light on the Instagram account that spilled these photos. So far, there is no response to the leaked wedding photos from either Jay Smith or Ashley Martson on their social media accounts, but they published very recently, so perhaps they’re strategizing on a response. Those two are never shy on social media, but will TLC allow them to comment or would it break their NDA if they speak out? Ashley and Jay’s Jamaican Marriage Legal? There were no photos of an actual wedding ceremony – just wedding-ish pics. An insider source leaked to Auntie’s Advice that Jay and Ashley held a ceremony in Jamaica because his family wouldn’t be able to make it to their event in Pennsylvania. However, it’s very hard to remotely verify a Jamaican wedding license so proof on whether it was just for show or was registered is still pending. Also, note the lack of wedding guests, so who’s to say what these photos really mean. According to Starcasm, who got a peek at their wedding registry before it was deleted, their wedding was set for May 26 in Ashley Martson’s hometown. If the pair did get hitched in the US, that would be legal and the status of the one in Jamaica wouldn’t matter, even if it was just for show. But Pennsylvania doesn’t make it easy to search their wedding records online either, so this matter is up for further research. 90 Day Fiance Wedding Canceled or Carried On? On the upcoming episode of 90 Day Fiance, Jay Smith and Ashley tell friends the racist hate they got on their wedding site has them thinking they should cancel the ceremony and go another route to make it official. But fans know how Sharp Entertainment edit promos to be extremely misleading, so what was really said (and happens) could be very unlike the promos shown by TLC. Another path to go with a 90 Day Fiance wedding is like Jon Walters and Rachel Bear Walters. They were married in the UK. Then Rachel certified their wedding by filing a document to register it in her home state of New Mexico. As of now, these wedding photos are just that. 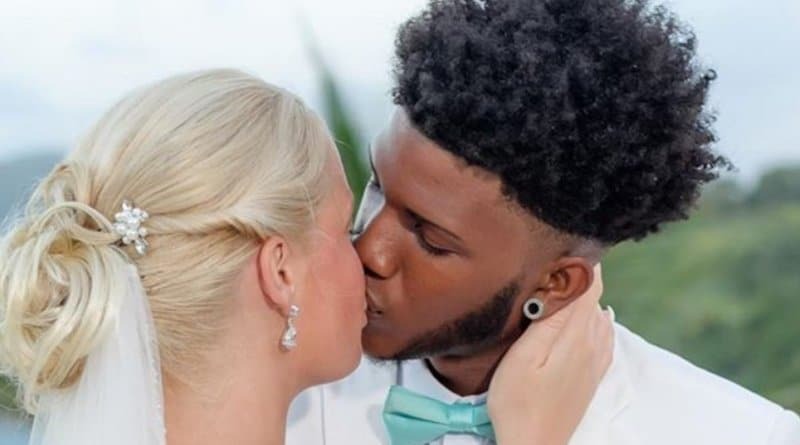 They are photos of Ashley Martson and her younger guy Jay in wedding attire taken in what looks like Jamaica. Who “Leaked” the Ashley and Jay Pics? Since their epic brawl on 90 Day Fiance, Ashley and ex-BFF Natalie Crawford have been in a flame war on social media. Natalie’s been spilling tea on Ashley. Meanwhile, Ashley ejected Natalie from being part of her wedding. 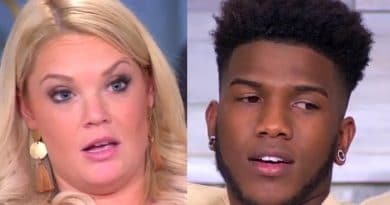 Natalie denies leaking and says it’s drama Ashley Martson is creating. Ashley denied this denial. It’s just a mess. So what do you think? Are these photos the real deal? Were Ashley Matson and Jay Smith married in Jamaica before they even began shooting this season of 90 Day Fiance? Will these photos get them in trouble with TLC? And – very importantly – who leaked them? It might be Natalie. It could be a friend (or ex-friend) of the couple. Or it might even be Ashley and Jay that did it for reasons known only to them. Stay tuned for more drama from these two Sunday nights on TLC. Check back with Soap Dirt often for more of these 90 Day Fiance spoilers and news.